Sarah Crichton Books, 9780374280130, 304pp. 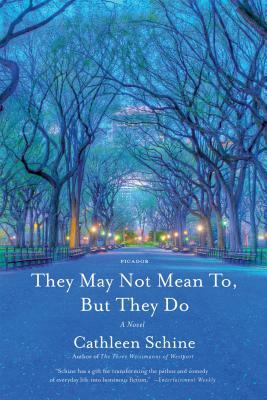 Cathleen Schine is the author of They May Not Mean To, But They Do, The Three Weissmanns of Westport, and The Love Letter, among other novels. She has contributed to The New Yorker, The New York Review of Books, The New York Times Magazine, and The New York Times Book Review. She lives in Los Angeles. “Cathleen Schine has written an entirely different kind of coming-of-age novel. This is not about how a twentysomething becomes a thirtysomething. It’s about how people making the difficult and at times scary journey into old old age figure out how to live. And it’s about the people who surround them—with love, anxiety, resentment, and sometimes complete misunderstanding. They May Not Mean To, But They Do is a great read: empathetic, and also very, very funny.” —Roz Chast, author of Can’t We Talk About Something More Pleasant? How do the aging parents described in the novel compare to your relatives? Who will your long- term caregivers be when you’re not able to care for yourself? Aaron is “sentimental and unreliable and brimming with love and obvious charm,” while Joy is “distracted, forgetful, thoughtful, brimming with love, too.” How were Molly and Daniel affected by having lovebirds for parents? In their own marriages, and as parents themselves, are Molly and Daniel very different from their parents? As Aaron and Duncan lose their grip on reality, which one fares better? What is the ultimate role of Walter, Wanda, and Elvira? How does Joy navigate the fact that they are paid workers, yet they are performing deeply personal work for a family that has become attached to them? Cathleen Schine is a master of tragicomedy. Which scenes made you laugh out loud, inappropriately? Where should Freddie and Coco fit into the decision-making for their in-laws? What are the advantages and disadvantages of being on the fringes of a family in crisis? Is “selling Upstate” the best solution to Joy’s financial conundrum? Should children help pay for their parents’ retirement? How does Joy’s life as a museum conservator reflect her perception of the past? Chapter 41 is just two sentences long: “Daniel asked his mother if she was depressed. She said, ‘Naturally.’ ” What do these seemingly simple sentences say about the nature of grief? How do you predict Ben, Cora, and Ruby will treat their aging parents? Would you have said yes to Karl’s proposition, even if it meant giving up a rent-controlled apartment? In the closing scene, as Joy helps Ben with a legal situation, why does she finally feel at home? What does she want her purpose in life to be? In the last paragraph of chapter 20, Joy turns the Philip Larkin lines cited in the epigraph on their head; in her version, “they” refers to the children, not the parents. What do her children mean to do, and why do they create such havoc for her? In each of her novels, which portraits of companionship and solitude does Cathleen Schine create? How do her characters tolerate loneliness, and each other?